This past weekend brought Roomie, Mrs. Roomie and myself to Atlantic City. I went for three specific reasons and a few vague ones just to keep it interesting. 1) We had floor seats to an Aerosmith concert 2) To have my first real poker experience at a casino and 3) To get the hell out of the city for while. The vague reasons included things like riding in a car, laughing at drunk people, and jumping on hotel beds. All went much better than I anticipated. I’ve talked on here about Aerosmith plenty, so I’ll not get into that again. Sammy Hagar opened with an awesome set. I’ve never seen him live and he was just as hyper as you’d expect. 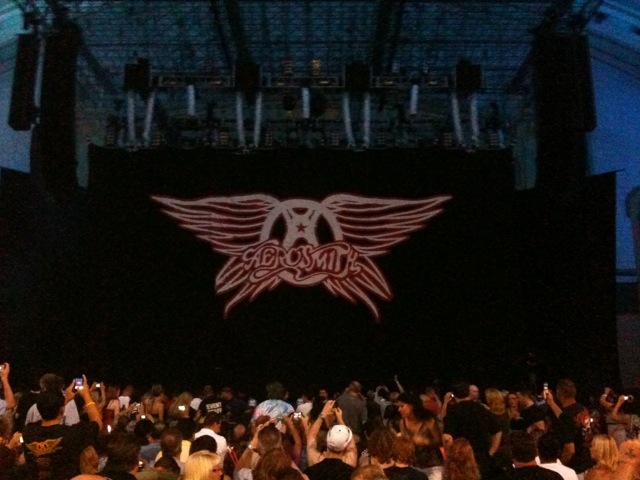 Aerosmith did great as always and our seats were really good. Highlight of the show: Joe Perry using his guitar strap as a whip and beating the strings on a guitar he had propped on an amp. I played Hold’em at Caesar’s Palace Saturday afternoon. I bought in for $180 and it was very educational. I’m a mediocre player at best, so I considered myself paying for the experience and assumed it was gone as soon as I sat down. I cashed out with $215 after about 2 hours. Nothing worth getting excited about, but hey, it’s 35 more dollars than I had when I walked in. I was up $150 at one point, but I made a stupid call which knocked me down pretty good. I started to fizzle after that so I got out while I was still ahead. Props to Roomie who walked away with over $200! I haven’t been to Vegas yet, but I think I understand why A.C. got the nickname “Dirty Vegas”. 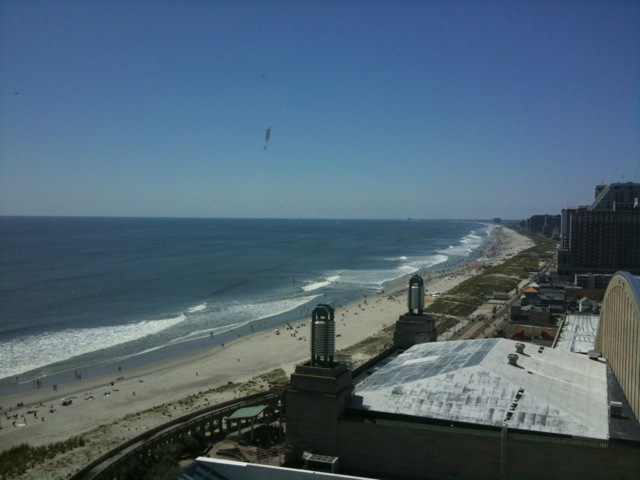 I’m sure A.C. is a lot smaller and it’s also attached to a pretty rough ghetto a few blocks away from the Boardwalk. Couldn’t even tell from our hotel though. Compared to the city this was a paradise. Also, I think of any place where I can see the ocean as “fancy”. A great time was had by all. I’m looking forward to another trip back soon for some more poker. I was too distracted this time with the concert and feeling a little touristy. I think I’ll play better when poker is my main reason for going. I Went to Jersey. Wii!! Howdy Everyone!Had a pretty great weekend, hope you all did as well. I hit 4 out of the 5 burrows and New Jersey this weekend. I went to a halloween festival type thing out in Flemmington NJ with some friends from Bklyn. I was pleasantly shocked by south Jersey, I really was. Back roads, trees, stars, country music and RANDOM legit southern accents from the locals. It was a pretty neat little event. There was a 45 minute hayride (ha!) that took us out through the woods and people would jump out and (try to) scare people. A few people were REALLY into it and screaming like crazy. Much enjoyment for people like me who don’t spook very easily. After the hayride they drop you off at the south end of a cornfield (at night, mind you) with a maze cut out into it. It’s not really a maze of course, just a winding path back to the main festival. There were people set up in there as well. Man, I want that job. A couple of the more convincing spooks had chainsaw motors with fake pointy ends on them. Sounded darn convincing though. I have to admit one of those guys got me pretty good. He waited for us to walk past and then cranked it up from behind. Had he not been the size of three of me he might have been in trouble. Exiting the cornfield opens you up to the line for the haunted house. I was underwhelmed with that as it was very predictable where everyone was going to be. I’d like to take this opportunity to thank the Resident Evil video game series for desensitizing me and teaching me how to check my surroundings for zombies. Metroid Prime 3 and Excite Truck for the Wii. My life is a little more complete now. As a result, you may not hear from me for a week or two lol. Be sure and check out the video for Excite Truck and note how you steer. Wonderful use of the Wii technology.I suppose that’s it for now. I’m ready to finish up October and get on with November (So I can get on with December and go see my family).